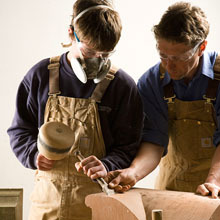 Each Spring LTM hold an apprentice recruitment Open Day with the view to recruiting the next generation of Stonemasons who will undertake a 4 year craft apprenticeship and learn the trade of stonemasonry. Successful candidates will embark on a 4 year apprenticeship with LTM which offers the opportunity to gain a wide range of onsite experience whilst supported by further study at college in years 2 & 3. The final year of the apprenticeship consists of onsite training and skills test. The LTM Apprenticeship Programme is open to all however candidates should be enthusiastic, willing to learn and committed to their chosen career. Candidates should demonstrate an interest and care for the buildings, the workplace and environment around them. To be considered for the annual open day candidates should submit in writing (by the 1st March) their CV and a covering letter outlining any previous experience in this area and suitability for this role. LTM Group, The Stables, Castle Fraser, Sauchen, Aberdeenshire, AB51 7LD, U.K.
As an Enrolled Practice LTM are committed to the design values and built environment principles held by the Foundation for the Built Environment. The Prince’s Foundation for the built environment is a charity which exists to improve the quality of people’s lives by teaching and practising timeless and ecological ways of planning, designing and building. For a Career that’s almost set in stone walk this way. Whether or not we have a Vacancy we would still love to here from you. To make it as easy as possible, there are three ways in which you can apply for a Job Vacancy within LTM. At LTM our people are our greatest asset and make us who we are, this is why we invest our time and resources in you.